Hanoi's Beer Corner is something of a traveller institution that's spilled over into nearby Ta Hien St to create what now may be better described as beer st.
Beer corner doesn't require much explanation. 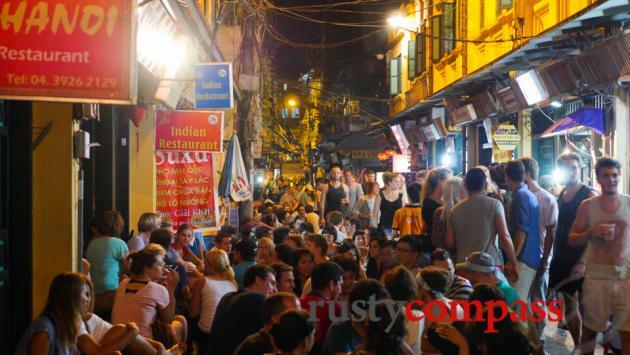 Each night, hundreds of travellers and a good number of locals descend on makeshift outdoor bars in the old quarter to sit on plastic stools, drink beer and watch the city rush by. 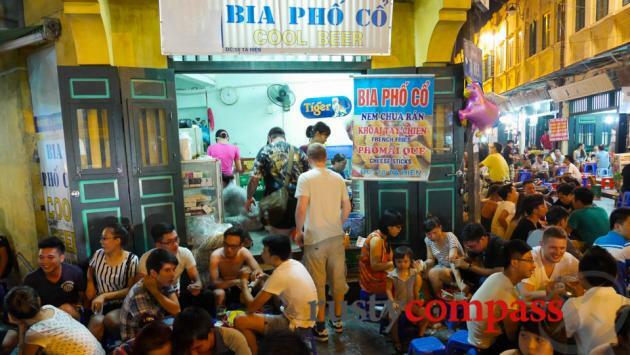 Especially busy during the hot nights of summer, this is not the best spot for Hanoi's famous bia hoi. Cold bottled beer is usually in good supply. Bia hoi is better had at random spots around the city - marked out by crowds of local men and bia hoi signage. Beer corner has recently spilled over into Ta HIen St creating a long strip of outdoor drinking that's become a backpacker magnet. Drinkers occupy their stools, grab their beers and try and make sense of the competing beats from the different bars. It's all a bit much and definitely not the place for a quiet drink. The backpackers haven't completely colonised the area. Young locals also gather in solid number. A new bar called Watch Out at 12 Ta Hien is especially busy with a live band playing local and foreign covers in a very tight space. Motorbikes still make their way through the crowds, often at silly speeds, so keep your wits about you.